Just under a year ago I came to Kiribati to identify an aviation investment project. I flew in with our lawyer Marta and administrative assistant Daniel to finish the process by negotiating the terms of the $US 23 million grant we would be providing. Since Marta was with me I arranged for a VIP reception and while she waited in the lounge I went out to have a look at the runway which is deteriorating very quickly. 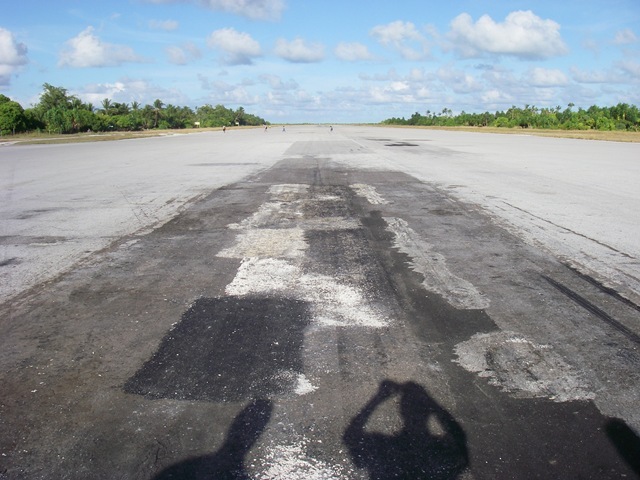 The photo to the left shows the high quality of the middle of the runway. I paced off some 350 square metres which we need to get fixed very soon. Rob Kaiwai is a really neat fellow. Not only because he stores my bike and trainer in the Tarawa High Commission’s garage. A former multi-sport athlete, he has great personal energy and enthusiasm. Foreign Affairs Minister Murray McCully has described the job of High Commissioner to Kiribati as the toughest assignment in the Ministry of Foreign Affairs. Rob Kaiwai talks about the challenges of representing NZ in one of the most remote and geographically dispersed countries in the world, and the challenges Kiribati faces from climate change and population growth. I love is way of describing Tarawa: imaging standing in the middle of a motorway with nothing but ocean on either side. Brilliant. And very accurate. Listen here and learn. You are currently browsing the World Bank Traveller blog archives for October, 2011.